I was so delghted to get a chance to revisit this Portal Tomb at Kilclooney More. On my first visit the rain came down as I walked up the track to the tomb, but today it was simply beautiful. 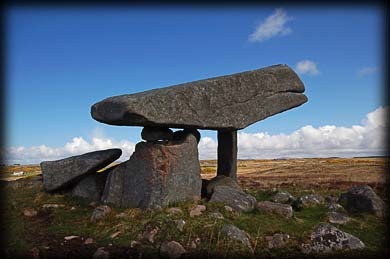 At Kilclooney More there are a number of megalithic sites, including three portal tombs and the remains of a court tomb. 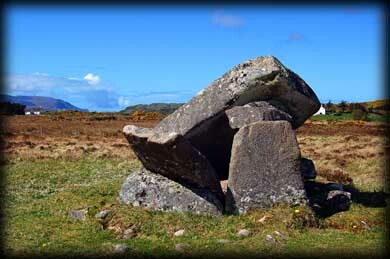 This is the better known and larger of the portal tombs and has a capstone some 6 metres long and as with most portal tombs seems to change form as you move around it. I have tried to show this in the images I have chosen for this page. Not more than 5 metres from this dolmen is a much smaller partially collapsed portal tomb pictured bottom. 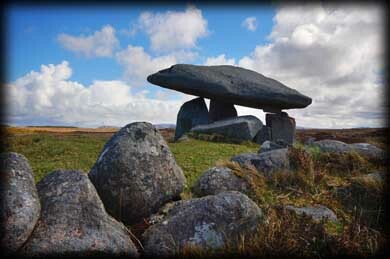 It is believed a single cairn may have completely covered the two tombs. Excavations at Kilclooney unearthed fragments of Neolithic pottery. I would strongly recommend a visit to this megalithic site for the atmosphere alone, Kilclooney More is without doubt one of my favorite sites. About half a mile west of here is a Court tomb in fairly good condition. 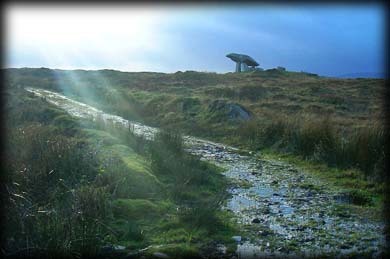 Other sites in this area include Doon Fort and Inishkeel. Situated: From Ardara take the R261 North to Kilclooney, facing the new Dolmen Centre in Kilclooney is a church, take the small track to the left of the church, this track takes you up to two houses, the first house on your left belongs to landowner Tony Mcnelis, a stile has been placed on the track for easy access. Discovery Map 10: G 7212 9672. Last visit April 2010.